Pat Chessell has made a name for himself as one of the most exciting live acts on the Vancouver music scene. His passionate, smoky vocals are complemented by Celtic fuelled sounds that stretch into influences of roots, folk, and alt-country. The Vancouver based folksinger began his career at a young age, performing as a guest with Danny Burns of the legendary Irish group, The Wolfhound. 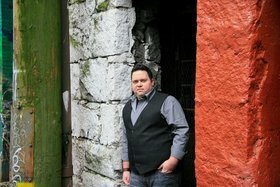 Chessell gained popularity in the Fraser Valley and Vancouver area as he and his backup band served as the house band at the popular Dublin Crossing Irish Pub for several years. Since then, he has transitioned from being a regular act in essentially every Irish bar in the Vancouver area to being a featured act at the Irish Pavilion during the 2010 Olympics; he has since performed in such festivals as West Vancouver's Harmony Arts, Celtic Fest Vancouver, Canadian Rockies Kitchen Party, Cloverdale Rodeo and Surrey Fusion Festival, to name just a few. He has been the opening act for the likes of Jim Byrnes, Derek Warfield and the Young Wolfe Tones, and The Town Pants, among others. From festivals to corporate shows, Pat Chessell's shows have proven to be a hit with all ages. He has gained himself a loyal, growing fan base due to his stage presence, talent and high energy. Pat plays approximately 150 shows a year and is currently working on a new, all-original album. The Guinness will be flowing for the perfect Irish Celebration, as the Pat Chessell Band fires up Blue Frog Studios for a foot-stomping, hand-clapping IRISH SHOW.